Vice goes searching for the true flavour of Norway. Interest in so-called "New Nordic Cuisine" - a traditionally-aware cuisine based on local raw ingredients with a strong connection to local customs - does not seem to be waning. On the contrary. 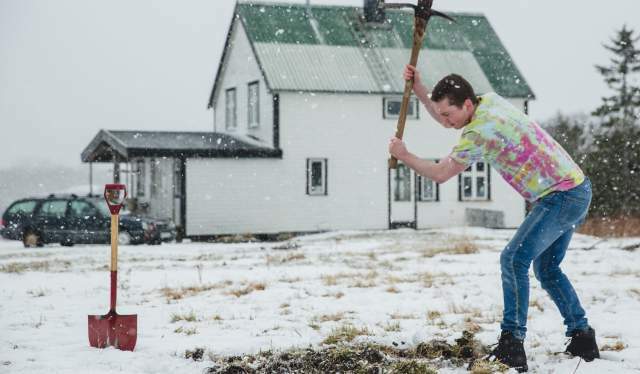 Currently, Norwegian food culture is the subject of a series produced by MUNCHIES, the food channel of the North American Media House, VICE, which is one of the world's leading producers of trendy lifestyle content. The result is five hot, vivid and funny portraits of the people, food and nature in Norway. Program host of the series, Halaigh Whelan-McManus, is not just anyone in the realm of Norwegian cuisine. "For the job you're doing here, it is basically essential that you manage to decode the country you're in. Get it under your skin!" In the first episode of MUNCHIES Guide to Norway, the destination is Frøya where he goes along on a diving session to get one of the real delicacies in Norway's domestic pantry - scallops. After a no-frills meal at the home of German scallop diver, Frank Ballack, we are taken to meet someone who creates art out of seafood - Roger Asakil Joya at Sabi Omakase in Stavanger, which has secured that regions only Michelin star. Naturally, Whelan-McManus also visits the Northern Norwegian gem of Lofoten. Here, he gets acquainted with another staple that is unique to our coastal waters - Skrei, the Norwegian Arctic cod, which grows to adult size in the Barents Sea and migrates to the Norwegian coast to spawn. Along with his compatriot, Roderick Sloan, he dives for ocean clam, which can be over 500 years old, and he will also try some local kelp that tastes like a truffle. However, Norway is more than just the sea. Norway has an abundance of mountains and Halaigh is joined by adventurer Randi Skaug - the first Norwegian woman to ascend Mount Everest - on his hike up to a snow-covered and windy Preikestolen. In Skaug's bag of provisions, we find energy-rich fare such as lefse, potato dumplings and reindeer heart - the latter with a distinct whiff of cow dung, but with a delicate taste, according to the valiant program host. Our man also gets to test his nerves as a ski jumper during the World Cup in Trondheim, Norway - luckily he has waffles with Norwegian brown cheese as a consolation. Further north, in Karasjok, the program host becomes familiar with Sami reindeer culture. Together with a young reindeer herder named Jon Mikkel, he takes part in the herding process from capture to dinner dish, with blood sausages and reindeer tongue on the menu inside a traditional Sami teepee - as well as the Northern Lights as a visual treat for dessert. “One of the most important experiences of my life," says a wide-eyed Halaigh. And by then, he has not yet got around to tasting King crab in Nesseby, Norway. Despite all the beautiful surroundings that are presented throughout the series: Food culture is also alive and well in urban areas. At Grünerløkka in Oslo, some of Norway's best coffee is served by Tim Wendelboe, the world champion who almost single-handedly changed Norwegians' view of the black drink. The journey ends with visits to Pjoltergeist, which is the favourite Norwegian restaurant of Maaemo head chef, Esben Holmboe Bang, and to the bar, Kniven, where obscure black metal and quality beer make up two of the fundamental elements. “Delicious" is probably the word Halaigh uses most frequently during the series. It is not particularly hard to understand why: Good luck controlling your appetite while watching this show.